Do you want to know the average value of each eCommerce transaction in your online store? You can easily find out by looking at the Average Order Value metrics in Google Analytics. 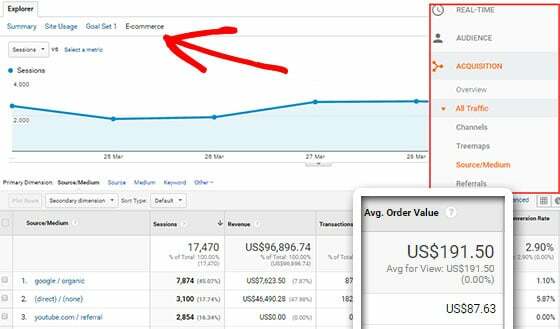 In this article, we’ll show you how to find your average eCommerce order value in Google Analytics. Average Order Value (AOV) is a metric that tells you the average value of an eCommerce transaction in your online store. In other words, it tells you, on average, how much revenue each order brings in. Why is Calculating Average Order Value Important? Just like conversion rate, average order value is also an important key performance indicator (KPI) that’s vital to your online business. For instance, by improving your conversion rate, you’re encouraging more users to buy from your store. Similarly, by improving average order value, you’re enticing your customers to spend more whenever they make a purchase. That means, aside from conversion rate, you’ll also have to focus on average order value in order to increase sales and revenue from your eCommerce store. Of the 2 methods, it’s far more convenient to view your report inside your WordPress dashboard. You don’t need to navigate away from your site or log into another website to view your reports. If you’re wondering how that’s possible, MonsterInsights is the answer. It’s the best Google Analytics plugin for WordPress. MonsterInsights makes it very easy to install and use Google Analytics on your WordPress site. Even an absolute beginner can easily set up Google Analytics and track their important website metrics using this plugin. Best of all, it allows you to see all of your website reports right inside your WordPress dashboard. 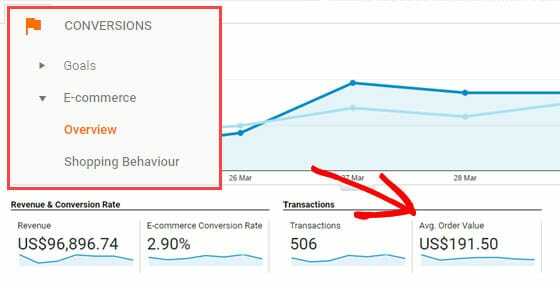 If you want to know more about how MonsterInsights makes Google Analytics simple, read our detailed post on MonsterInsights vs. Google Analytics. Having said that, let’s get started with setting up eCommerce tracking in Google Analytics. First of all, you’ll need to set up Google Analytics on your site. Next, you’ll need to enable eCommerce tracking in Google Analytics. 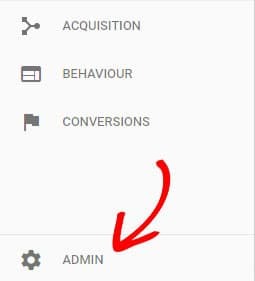 Sign into your Google Analytics account and click the Admin menu in the right menu bar. Then, navigate to eCommerce Settings under the View column. After that, the eCommerce setup window will open. Turn on Enable eCommerce first. 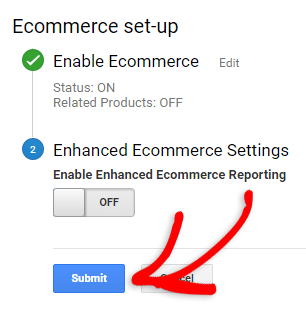 Then, turn on Enhanced eCommerce Settings and click the Submit button. After that, open your WordPress dashboard and navigate to Insights » Addons. 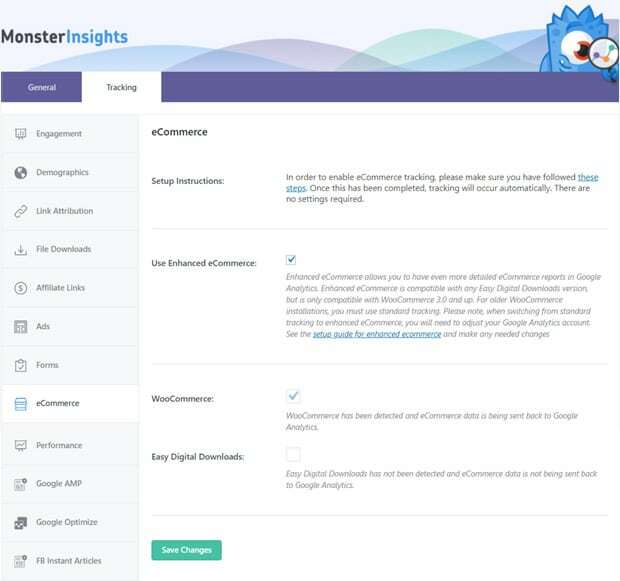 Then, install and activate MonsterInsights eCommerce in just 2 clicks. Now, MonsterInsights will automatically detect your eCommerce plugin (WooCommerce or Easy Digital Downloads) and start tracking all your eCommerce data including the order value. You can check on that by going to Insights » Settings » Tracking and clicking on the eCommerce tab. Make sure that there’s a check mark on Use Enhanced eCommerce and your plugin is detected. Then click the Save Changes button. Now, Google Analytics will start gathering data on your eCommerce sales. Once you’ve completed setting up your eCommerce tracking, you can check your reports after a few hours have passed. Google Analytics usually takes 24-48 hours to gather the complete data you’ll need. With MonsterInsights, it’s really easy to view your eCommerce reports because it allows you to see the most important data directly inside your WordPress dashboard. 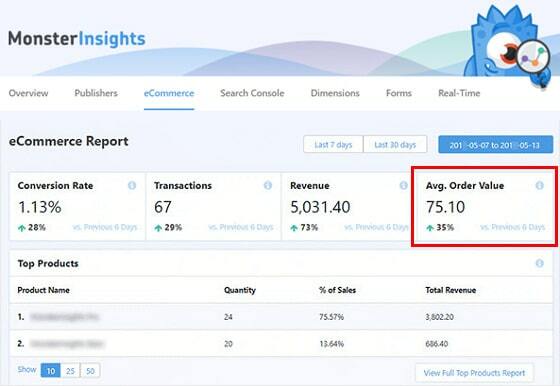 To view your eCommerce reports, go to Insights » Reports from your dashboard and click the eCommerce tab at the top. As you can see in the screenshot above, you’ll see your eCommerce store’s average order value along with your conversion rate, total transactions, top products, etc. Next, we’ll show you how to see that same report in Google Analytics. First, visit the official Google Analytics website and log into your Analytics account. 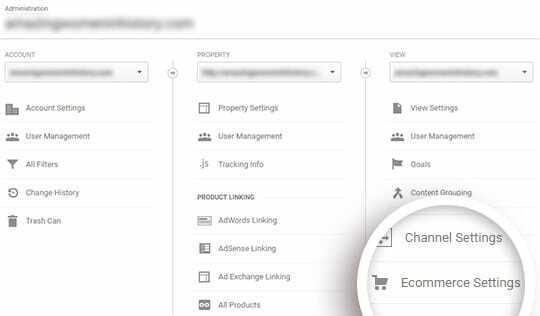 To view the AOV of your entire site, navigate to Conversions » eCommerce » Overview. You’ll see the metric Avg. Order Value along with many other metrics. To view AOV by traffic sources, navigate to Acquisition » All Traffic » Source/Medium. Then click on E-commerce under the Explorer tab. In the table, you can see the Avg. Order Value column. When you know which traffic sources are bringing in the highest average order values, you can focus your marketing efforts on what works and figure out how to optimize your other traffic sources. We hope this guide helped you to find the average eCommerce order value of your store. If you’re looking to boost sales and revenue from your store, you’ll enjoy reading this guide on eCommerce customer retention strategies.